Painter MICHELANGELO MERISI (Nigel Terry), born at Caravaggio near Milan in 1571, lies on his deathbed in a simple room in Porto Ercole, Tuscany. He is in his fortieth year; his face bears savage scars. He has been on the run for years and is dying far from home. It is a miserable death for an artist of stature. What has brought him here? After serving an apprenticeship to a painter as a boy, the young MICHELE CARAVAGGIO (Dexter Fletcher) moves to rome, where he struggles to live by selling his paintings on the streets. Ill from poverty, Caravaggio paints himself as Bacchus. He is visited in hospital by CARDINAL DEL MONTE (Michael Gough), an art lover who is intrigued by this painting. 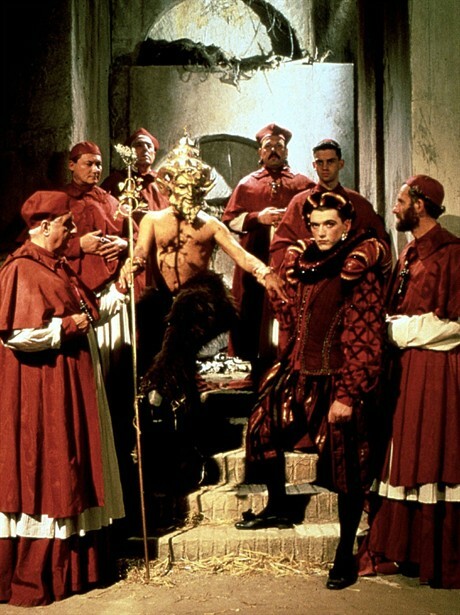 The Cardinal gives him room and board in his palace in return for his services. Under Del Monte’s patronage he continues his education and wins his first major public commission for the French church of St. Louis in Rome: The Calling of St. Matthew and The Saint’s Martyrdom. 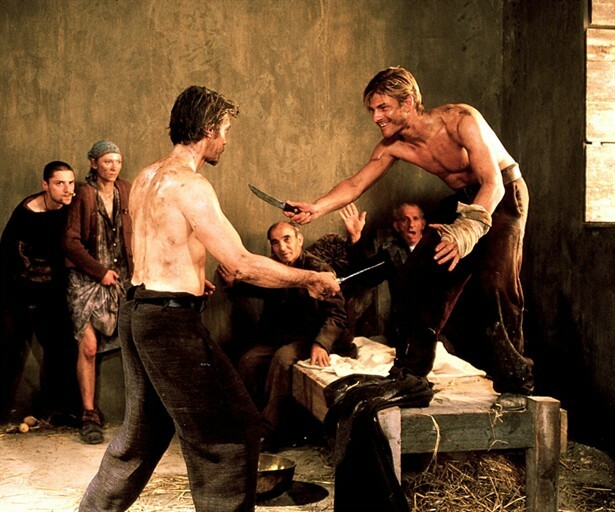 Executing the work is causing Caravaggio great trouble until, in a tavern he frequents, his attention is drawn to RANUCCIO THOMASONI (Sean Bean), a young gambler on the make. Ranuccio, to whom Caravaggio is attracted, joins the painter’s band of low-life models as St. Matthew’s killer, and the paintings progress. Caravaggio also paints Ranuccio’s woman, the beautiful prostitute LENA (Tilda Swinton). A knife fight erupts between Caravaggio and Ranuccio over a bet and Caravaggio is wounded. The developing triangular relationship between the two men and Lena deepens. MARCHESE VINCENZO GIUSTINIANI (Nigel Davenport), a prominent banker who has rescued Caravaggio from the outcry caused by one of his St. Matthew paintings by taking it for himself, commissions Caravaggio to paint Eros (or Profane Love) from life. Caravaggio invites both Ranuccio and Lena to Giustiniani’s fashionable unveiling party. Amid the decadent glitterati of Rome, Lena is introduced to CARDINAL SCIPIONE BORGHESE (Robbie Coltrane), nephew of the Pope and the most powerful political figure in Rome. Borghese is impressed. Away from the crowd, BAGLIONE (Jonathon Hyde), a rival painter, concocts slander about Caravaggio’s depravity. Tragedy looms when Caravaggio paints Lena as the Magdalen. While posing, she reveals the extent of her scheming to ensnare Borghese and leaves Ranuccio and Caravaggio to each other. Later Lena is found drowned in the Tiber. Ranuccio is arrested for her murder and, protesting his own innocence, blames Borghese. While Ranuccio is in jail, Caravaggio drinks in the tavern. On his release, Ranuccio greets Caravaggio with a terrible revelation of guilt and is stabbed by his lover.